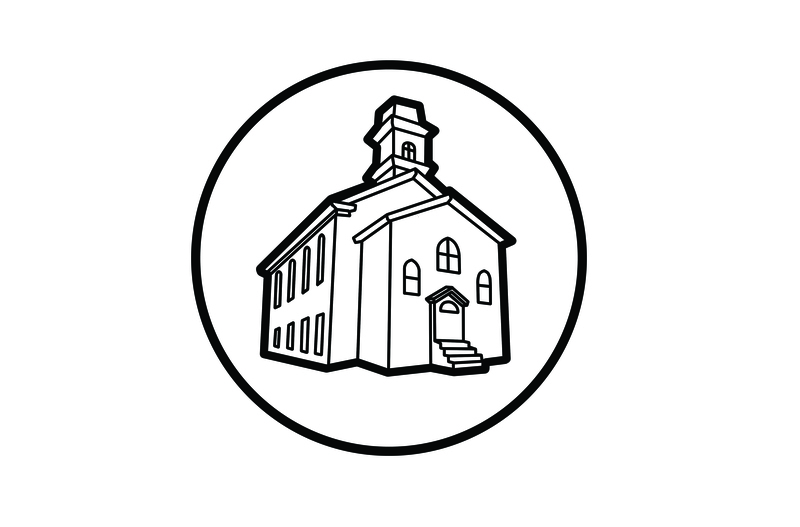 The Computer Church: The Type 001 Keypunch, British Tabulating Machine Company, Ltd.. Type 001 Keypunch, British Tabulating Machine Company, Ltd. The machine was hand operated and the process of pressing a key to punch a hole in the card would also advance the card one column. 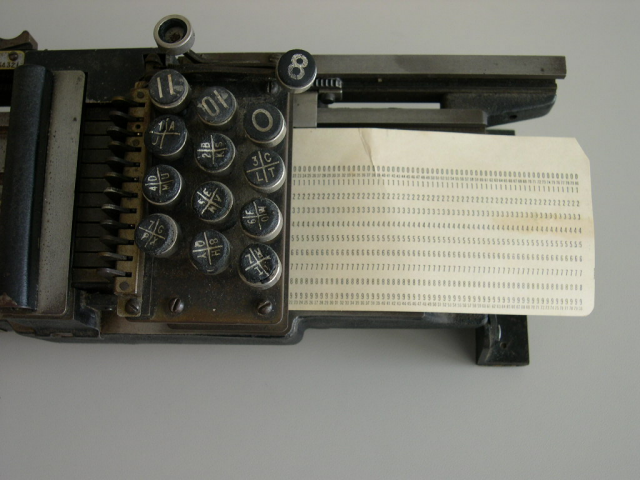 In 1923, IBM introduced an electically powered keypunch. Punching the holes in the card was not a quick process. 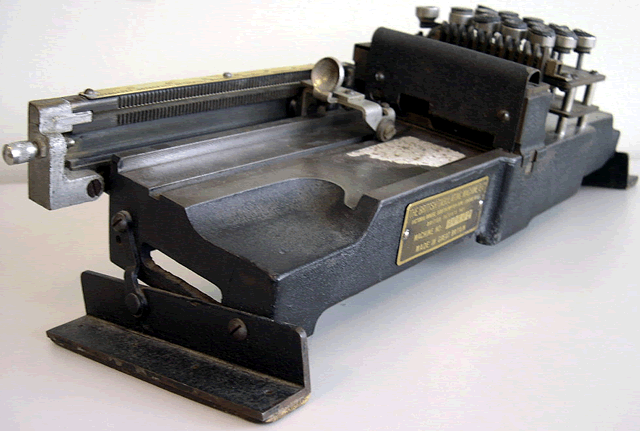 The holepunch operated by sliding the card right to left underthe keypad and the holes were punched by the operator. However, the card had to be loaded from the left side of the keypad and slid under the keypad to the right where it fit snugly against a metal stop and under a round metal guide (see images). Then the left end of the card was clipped under the card guide and the operator would begin punching. The keypad had total of 14 keys. The topmost key (on our machine the topmost key is missing the hard rubber inset), would allow the card to slide freely from right to left so that it could be removed from the hole punch. It would be the key you pressed when you were done punching holes. The second key from the top (on our machine it is marked with an "8") would advance the card one column without punching a hole, so it was used when the operator wanted to skip a column. The remaining 12 keys were used to punch holes. The last nine keys were the heart of the hole punch and the wear and tear on the hard rubber tops of these keys indicated their considerble use. These keys were ordered from the top left key (#1) to the bottom right key (#12). You can follow the order in closeup images of the keypad...#1 to #2 to #3 moved from left to right on a slight downward angle, and then continued with #4, #5, #6 on the second row. Each key was divided into four parts; the top left were the numbers, the top right were the letters "A" through "I", the bottom left were the letters "J" through "" and the bottom right were the letters "S" through "Z". Key #1 did not have a bottom right letter (otherwise we would have ended up with 27 letters!). The manufacturer's tag indicates that this is machine #60402. We assume this is the serial number of this machine and not a model number. There is a marking under the machine with the number 918876. We do not know what the second number is for. How old is this mechanical keypunch? 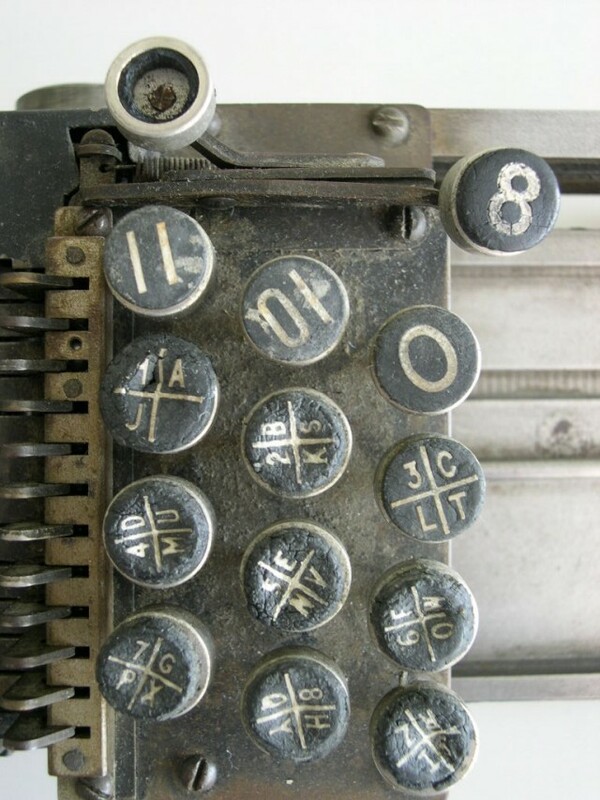 We are not sure when this keypunch was originally manufactured. We believe it to be between 1909 and 1919. We base that belief on the following clues from the nameplate on the keypunch. It wasn't until 1908 that Hollerith's Tabulating Machine Company gave an exclusive license to a company called Tabular Limited. The Tabular Limited changed its name to the British Tabulating Machine Company Limited in 1909. 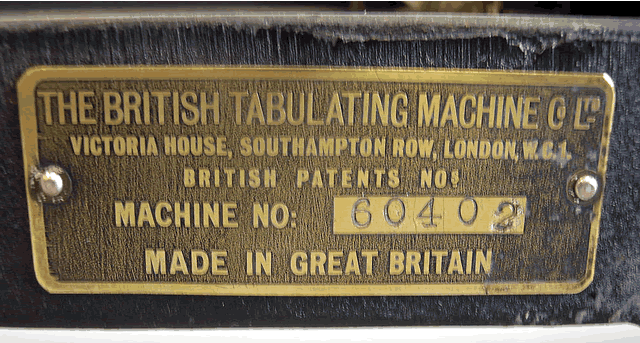 Since the nameplate lists the "British Tabulating Machine Co. Ltd." then it must have been made after 1909. BTM moved from Southhampton Row, London to Letchworth, Hertfordshire in 1920. Since the nameplate gives the address as Victoria House in London we can surmise that this keypunch was made before 1920. If you choose the midpoint of that time-span, it would place the keypunch at 1915. If you have any information on this keypunch, please contact us. I own a HOLLERITH punch card machine. the address on the machine is 17 Park Lane London W1. I used one of these in 1969 when I worked at British Rail. Just read your description of a card punch, noted the section on usage of keys. The keys "11", "10", and "0" were used in combination with other numeric keys to provide alphabetical characters and full stops, commas etc. No more than 3 keys could be used at the same time. Initially BTM punches used what was known as "2 zone alpha", it was then changed to "3 zone alpha". I worked with a number of Tabulator systems in the 1950s for a few years before progressing to computers.